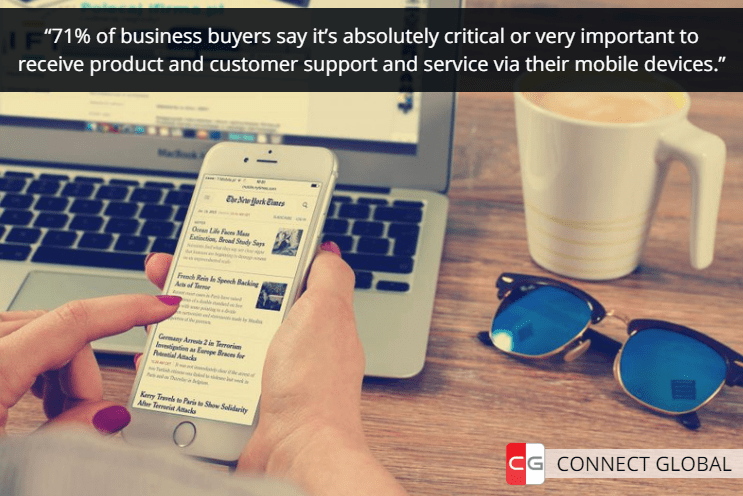 Most businesses rely on a highly-trained sales force to inform customers of features and benefits of buying a product. For many companies, it is inconceivable that customers would NOT encounter a sales person before a purchase. The reality is quite different. Trends in customer service show a concentrated move away from actual live support or the addition of non-human customer support to add contact choices and avoid customer service inconsistencies. It is rare today that customers call a company service center without going through an automated system that screens the reason for the call. As well, online chat and virtual reference centers for shopper services are rising to the forefront of customer service. More and more, businesses are using sales brochures and shelf labels with a SCAN NOW code for marketing materials, customer service, and product information. Learning more about the product or service is now in the hands of the customer. As we move into a digital experience, marketing materials must meet the customer in their comfort zone for language, technology, and cultural references to be successful. In short, a customer does not want to take the time to engage with real people for support anymore. Customers want to get problems fixed quickly and resolve support issues so they can move on with their day. In the past, customer engagement made the difference in how the buyers viewed the product and the company. Although this still holds true, the variable success measurement is how quickly and efficiently customer service answers questions. The rise of technology has changed the definition and delivery metrics for customer service. What does this customer service trend mean to a sales force? Just as buyers want a fluid customer service and support experience from businesses, many consumers will want to purchase a product without talking to a salesperson. As it becomes more commonplace for customers to buy without engaging an actual sales person, the speed and efficiency of the sales cycle increases; however, the void of information can be greater. One example of the rise of technology yielding a sales force free shopping experience is the new Amazon Go stores (see video below). These stores allow a real APP SHOP experience for the customer. As the buyer picks up items to add to their shopping cart, the bill is tallied and paid upon leaving the store without even contacting a sales person throughout the buying cycle. Buying is completely free range and at the customer’s whim. You might be thinking to yourself that a buyer might walk into a grocery store to buy a soda without a sales person, but would a customer buy a high-end product online? Large online retailers like Amazon have been selling computers, televisions, and big ticket items for years with only a review page, some pictures, and a checkout button. The sales model is proven in the marketplace. What does the ‘DISAPPEARING SALES FORCE’ mean to your marketing? If customers are allowed a free range buying experience, then the sales person will become more an intrusion to the sales process than a benefit. Without the sales person available to explain the benefits of a product or upsell complementary product, then the buyer must rely directly on the marketing materials available at the kiosk or interactive stations. In a global economy, where languages and cultures meet to shop and spend money, translation and transcreation must be on point to make the sale. Gone are the days when salespeople dutifully explained and translated marketing materials for the buyer. 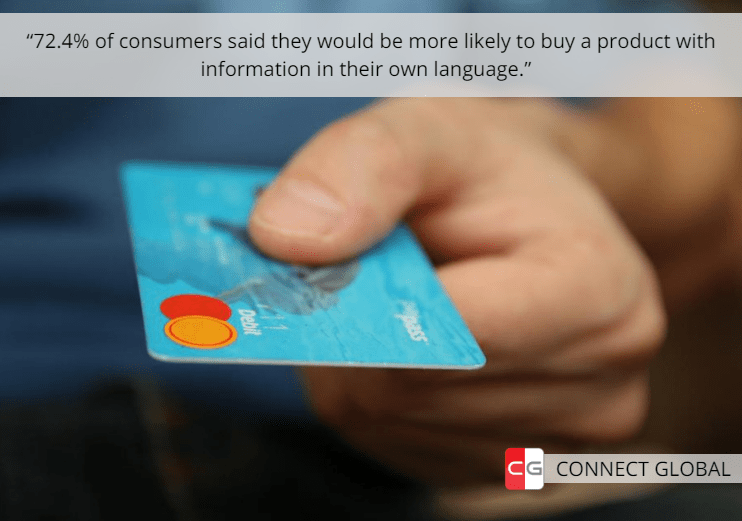 Studies show that a customer is more likely to buy a product when the marketing and sales information is in their own language. This is where accurate and effective translation makes the difference in a brick and mortar store. If your sales and marketing materials are not ready to welcome, greet, and sell the product, then your buyer will walk on to the next seller. Without an available sales person, your buyer is relying on the marketing materials provided to close the buying cycle and your company is betting on the same thing. How does CONNECT GLOBAL assure proper branding, marketing, and transcreation in a global marketplace? Your potential customers around the globe are more likely to make buying decisions from materials in their own language. Simply put – if customers can’t read or understand, they won’t buy. As market segmentations continue to grow globally, buyers are more inclined to default into their own technological comfort and stand behind an electronic experience like chat or mobile customer service. The disappearing sales force makes room for your marketing to reach out to customers and engage them in the buying cycle with accurately translated marketing materials aimed directly at the interests, language, and culture of the buyer.